Sen. John Kerry, President Obama's nominee for secretary of state, told the Senate Foreign Relations Committee on Thursday that if he is confirmed, he will "look forward to continuing to work particularly closely" with members of the panel, which he chaired for the last four years. Kerry, a longtime senator from Massachusetts, said his approach is informed by his 28-plus years on the committee and in the Senate. "I'm already excited by the many ways in which we can work together and in which we must work together to advance America's security interests in a complicated and even dangerous world," he said. Kerry has to be confirmed by the full Senate. 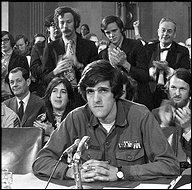 Before he spoke, outgoing Secretary of State Hillary Clinton, U.S. Sen. John McCain, R-Arizona, and U.S. Sen. Elizabeth Warren, D-Massachusetts, praised Kerry and called for his confirmation. Obama nominated Kerry last month.